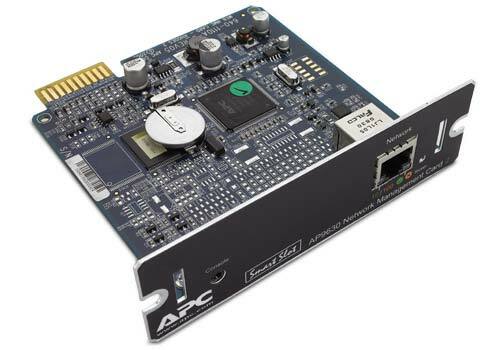 APC UPS Network Management Cards allow for secure monitoring and control of an individual APC UPS via web browser, command line interface, or SNMP. Embedded technology provides exceptional reliability with notification features that inform you of problems as they occur. For protected servers, the included PowerChute® Network Shutdown software provides graceful, unattended shutdown in the event of an extended power outage, always keeping business information safe. Please Note: Incompatible with Smart-UPS SMX and SMT. Features: Customizable Input Contacts, Humidity monitoring, Temperature monitoring, Customizable Output Relays, Browser Accessible, Flash upgradeable firmware, Reboot equipment remotely, Password Security, Three-tier user access, Radius support, PowerChute Network Shutdown, Compatible with Smart-Slot enabled UPSs. UPS Management SmartSlot offer with serial shutdown support of up to two additional devices such as Servers and Network Storage Devices. Features: IPv6 Support, Device Encryption via HTTPS/SSL, SSH (up to 2048-bit encryption) or SNMPv3, Browser Accessible, Flash upgradeable firmware, Reboot equipment remotely, Password Security, Three-tier user access, Radius support, PowerChute Network Shutdown, Compatible with Smart-Slot enabled UPSs. 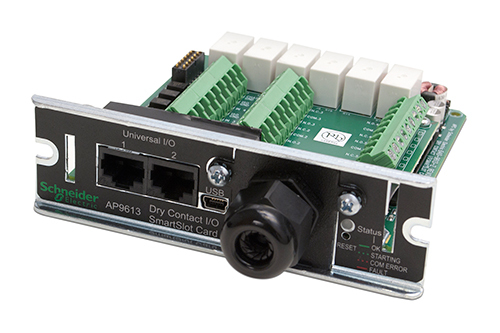 Features: Customizable Input Contacts, IPv6 Support, Device Encryption via HTTPS/SSL, SSH (up to 2048-bit encryption) or SNMPv3, Humidity monitoring, Temperature monitoring, Customizable Output Relays, Browser Accessible, Flash upgradeable firmware, Reboot equipment remotely, Password Security, Three-tier user access, Radius support, PowerChute Network Shutdown, Compatible with Smart-Slot enabled UPSs. 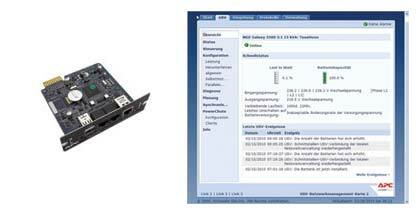 Features: Customizable Input Contacts, Customizable Output Relays.